Last week was one of my busiest weeks – on Monday, I flew to Kansas City for an exciting project I’m working on. After spending all day Tuesday on my feet in a test kitchen, I flew back to New Jersey that evening. Wednesday, I had meetings during the day and then that evening, 5-10:30pm, I taught an Inspiralized cooking class! What a blast that was! I’ve been slowly posting some of the photos that my wedding photography, Nadya Furnari, took. 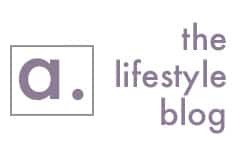 The class was entirely spiralized – all recipes made from the blog! It took place at Hudson Table in Hoboken, NJ. 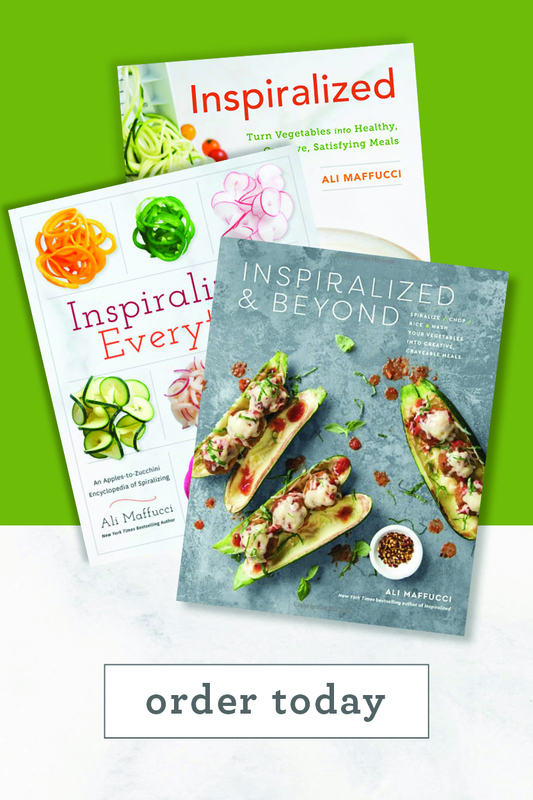 We made my Shredded Kale, Brussels Sprouts and Pear Noodle salad, my Pesto Zucchini Noodle Stuffed Bell Peppers, my Bikini Bolognese with Sweet Potato Noodles and then ended it all with my Zucchini Noodle Chocolate Chip Muffins. 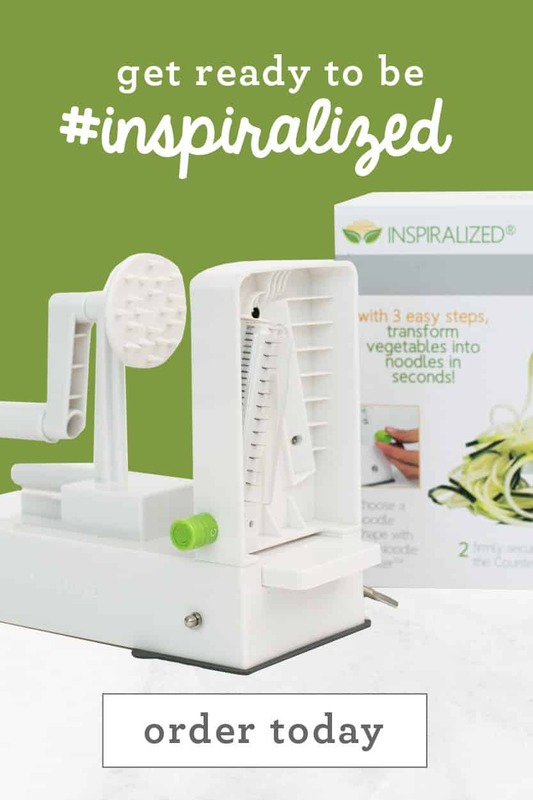 The class was BYOB and everyone drank wine and made deliciously healthy spiralized meals, using the Inspiralizer! On Thursday, Lu and I had a rehearsal dinner in the city and then on Friday, our friends got married in Battery Park. What a gorgeous ceremony and beautiful event – we danced our feet off! I do appreciate a good wedding photo booth. So on Saturday, we woke up at 12pm. I can’t remember the last time I slept in that late – I think I was 23! 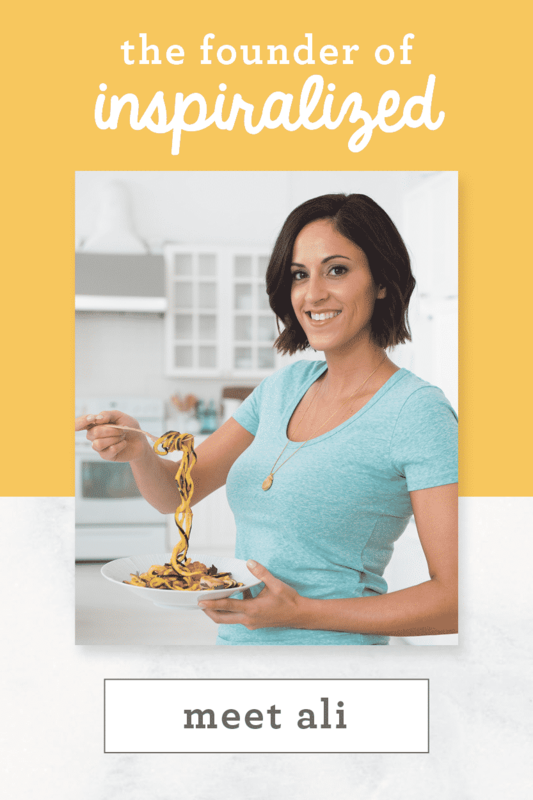 Long story short, it was an exciting, jam-packed week and now, although I’m traveling again Thursday – Sunday of this week, I’m excited to make some healthy spiralized meals – quick, easy ones! That brings me to today’s recipe: I make this recipe a lot during the fall and winter. It’s the first time I’ve made it this fall season and I’m excited to bring it back into rotation. 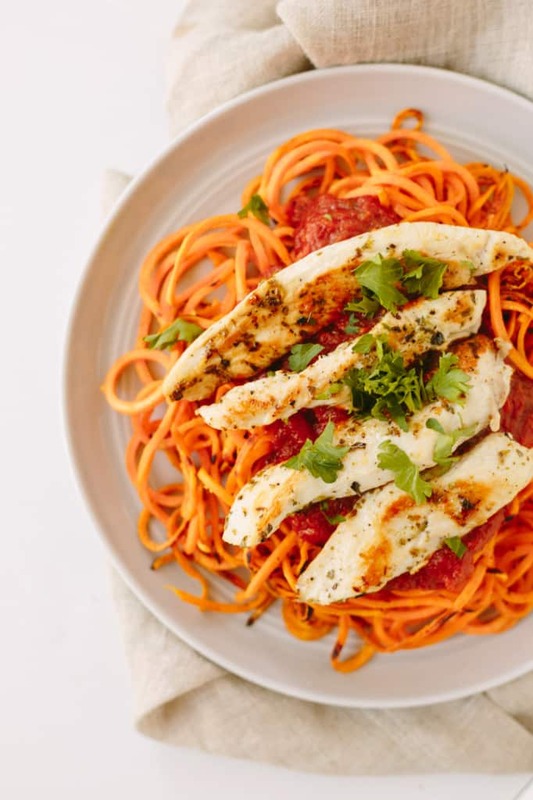 I use my favorite clean-eating friendly tomato basil sauce (Rao’s Tomato Basil), cook chicken with oregano, salt and pepper and serve it with sauteed sweet potato noodles. 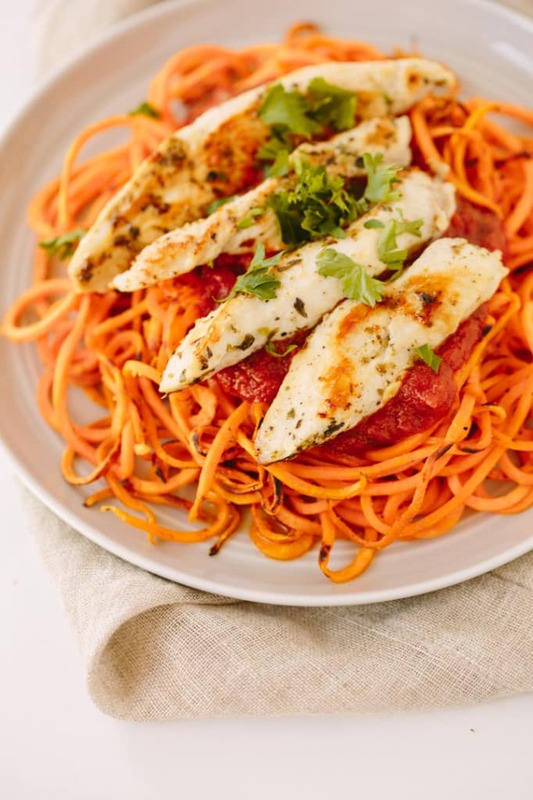 The sweetness of the tomatoes brings out the inherent sweetness of the sweet potatoes and works deliciously with the savory chicken. This dish is packed with fiber, protein and flavor! I hope you try it for yourself and work it into your own rotation – it takes less than 30 minutes and it can all be prepped in advance! Place a large skillet over medium-high heat and add in 1 tablespoon of the olive oil. While oil heats, season the chicken with salt, pepper, oregano and garlic powder. Once oil heats, add in the chicken. Cover and cook for 10 minutes or until chicken is cooked through and no longer pink on the inside. 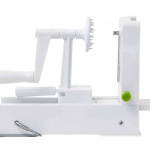 While chicken cooks, peel and then spiralize the sweet potato with Blade D on the Inspiralizer. Set aside. Set the chicken aside on a plate and cover to keep warm. Then, carefully wipe down the skillet and add in the other tablespoon of olive oil. Then, add in the sweet potato noodles, season with salt and pepper and cook, tossing frequently, until al dente, about 7 minutes. 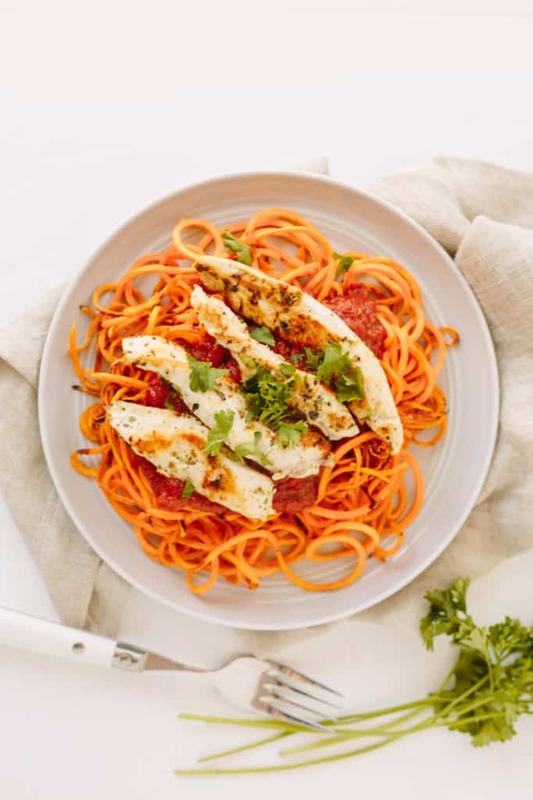 While sweet potato noodles cook, place a small pot on medium heat and heat up the tomato basil sauce. Let simmer while sweet potato noodles finish cooking. When sweet potato noodles are done, divide onto two plates. 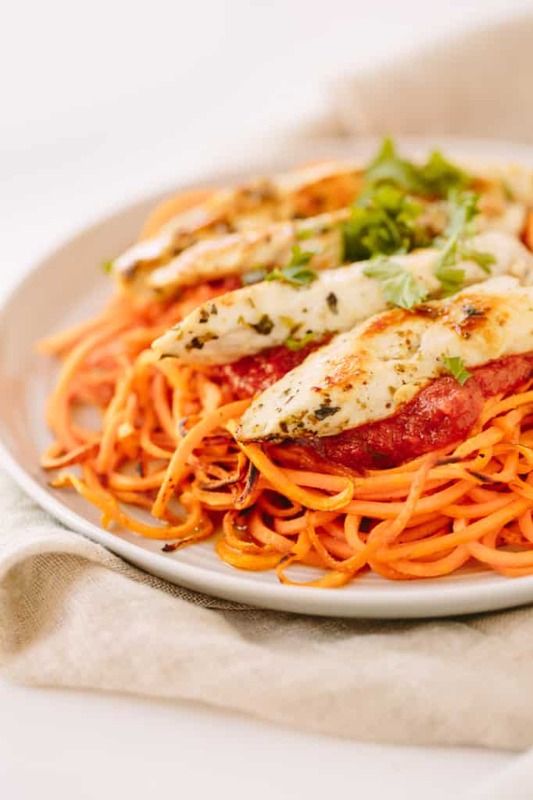 Top the noodles with tomato basil sauce and then chicken. Garnish with parsley and optional parmesan cheese. It's Blade D on the Inspiralizer! I sent you an email explaining my confusion. My knob is off - My D is your blade A and makes discs. I made matchsticks out of the discs and the recipe was delicious. 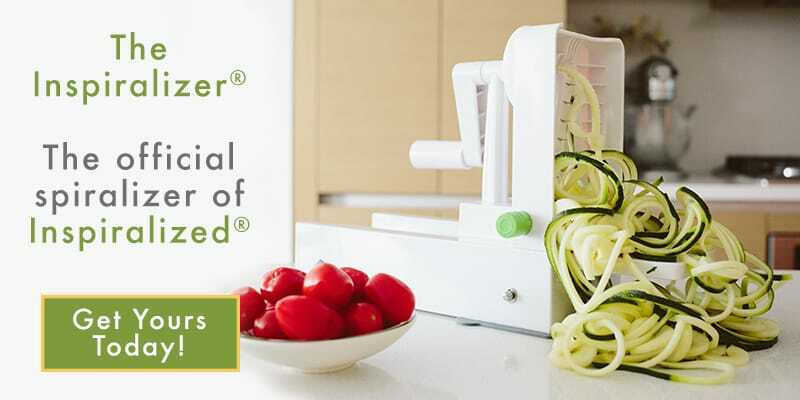 This dish looks delicious and perfect opportunity to use my brand new Inpiralized spiralizer. Ali, I cannot wait to try this recipe. Hubby will get sweet potatoes at the store this afternoon, and I will make the recipe as soon as I go to Sprouts to get organic, range-fed chicken breasts. Yum, Yum!!! 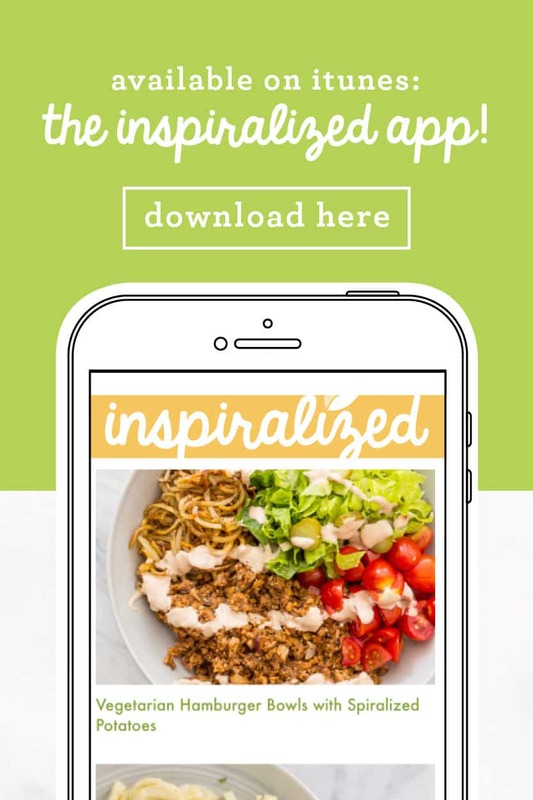 I love, love, love, my Inspiralizer. It is awesome. Sounds like the perfect evening! Enjoy! Why is the fat percentage so high in the sweet potato recipe? Mmm! This meal would make a perfect dinner for me! What has changed about this website such that I can no longer print out the nutrition panel nor a picture of the recipe. I still am able to print out the recipe. The nutritional information and images have never been printable - they are separate from the printable recipe. It's a change we're going to try to make soon! 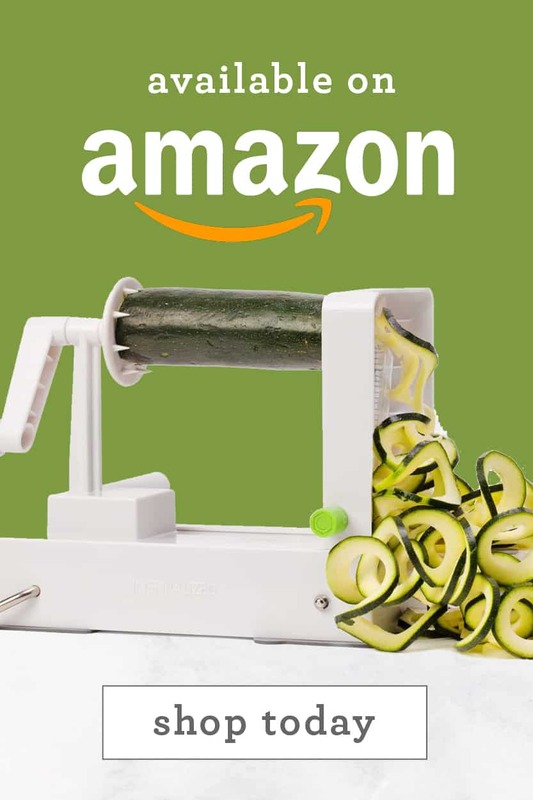 Is there something done to the sweet potatos before they are put through the inspiralizer? Mine are always so hard that even with the ribbon disc, they break up. They won't go through the d disc to make noodles. Do they need parboiled? I'd love to try making noodles but the sweet potatos are not cooperating like a regular potato. This looks healthy and delicious! 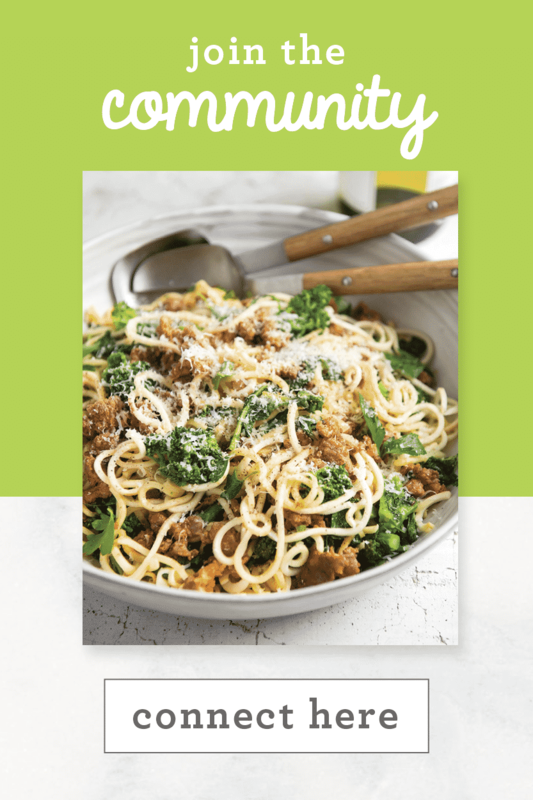 Perfect for a weeknight dinner! Dear sir/ma'am please give me any ideas for making nutritious new food products development. Yes, of course! That would be great!